Heat oven to 350°F. In medium bowl, combine cookie crumbs and 1/4 cup sugar; mix well. Stir in butter. Press crumb mixture in bottom of ungreased 9-inch springform pan. Bake at 350°F. for 10 minutes. Cool 10 minutes. Wrap outside of pan, bottom and sides, with heavy-duty foil. Reduce oven temperature to 325°F. Beat cream cheese in large bowl at medium speed until creamy. Beat in 3/4 cup sugar until very soft and creamy. Add sour cream and almond extract; beat well. Reduce speed to low; add eggs one at a time, beating just until combined and scraping down sides of bowl after each addition. With wire whisk, beat in pudding mix until well mixed. Stir in vanilla chips. Pour into crust-lined pan. 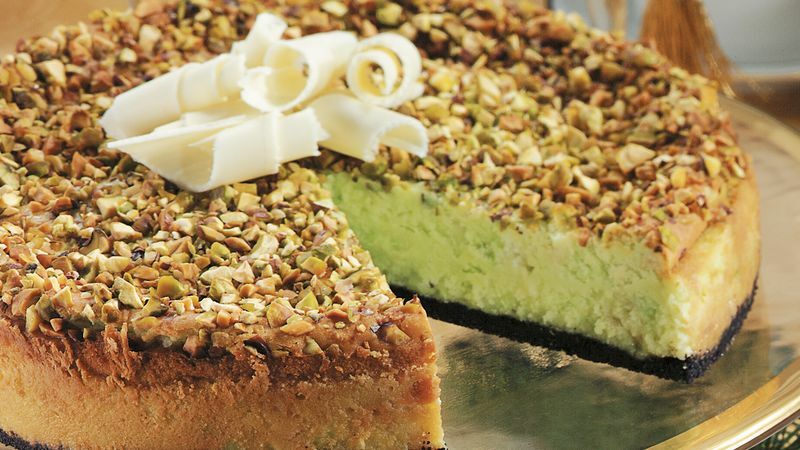 Sprinkle pistachios over top. Bake at 325°F. for 1 hour 15 minutes to 1 hour 20 minutes or until sides of cheesecake are set and slightly puffed but center still moves slightly when pan is tapped. Cool cheesecake in pan on wire rack for 1 hour. Cover; refrigerate at least 3 hours before serving. To serve, remove sides of pan. Cut cheesecake into wedges.